Although I didn't realize it until recently, most of my favorite childhood memories include a man by the name of Guido Rachiele. My dad would pull into the driveway at my grandma Iris' house and I'd jump out, blow Granny a kiss and run down to the Checkerboard Grocery. Guido would let me 'hang out' behind the counter, pop open an icy Coca-Cola for me and we'd talk. Often penny candy was involved in the conversation. I stood next to Guido watching the 4th of July parade that summer; he was the mayor of Price and as far as I was concerned he was the most important person I knew. Part of that respect stemmed from the fact that Guido's involvement with my family actually began when he caught my father waxing the windows of the store one Halloween eve when my dad was a teenager. Cool! My family left Utah in 1975 and I finally made my way back to visit Checkerboard Grocery a few years ago. I walked in and there stood Guido, full length apron, white shirt with rolled cuffs, a tie and the smile I'd hadn't forgotten during the 28 years since I'd last seen him. He took one look at me and said "You're Frank Potts' kid!" He popped open a Coca-Cola and listened to my stories of BELLA Main Street Market. I told him about my 'house accounts', my civic involvement and how I loved giving out 'penny' candy just like he had. He listened, smiling the entire time and then told me that I had to be open 7 days a week. If I was truly following my mentor, I'd have to let my community know they could really "depend" on me, that BELLA would be open when they needed it to be- something Guido did for 60 years until this past January. So I was kinda shocked when I read that he had closed the store. 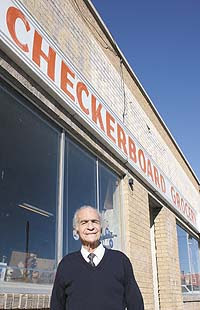 However, the loss of Checkerboard Grocery gets chocked up to the changes in our culture not any change in the way Guido opened his store every day. There are still 'mom and pop' stores around (goodness knows that Baker City is a gold mine when it comes to that kind of entrepenurial folly!) but there aren't many small suppliers left to service them. So I'm counting my blessings today. I'm lucky BELLA happens to be along I-84, and that our organic grocery supplier is so accomodating. We are also fortunate to have local growers that deliver herbs, peaches, pears, garlic, lamb, beef and honey whenever we need them! Our wine importers are fantastic; the local guys take such good care of us and the Portland folks are great about delivering our cheeses and imported foods along with the vino! 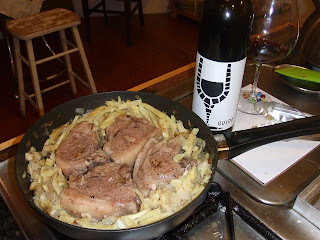 So yes, it's a wordy 'blog-day' but what I really wanted to do was pay a little homage to my 'godfather' and share a recipe I created to go with a wonderful bottle of wine appropriately named Guido! K Vintners is one of my favorite NW producers. Charles Smith has a brilliant touch when it comes to varietals like Syrah and Grenache and he creates the most remarkable labels in the biz from his century old home in Walla Walla. In '03 but he produced a Sangionvese blended with Syrah that he called Guido. I had to have it! So with Mr. Rachiele in mind, and a glass of Guido in my hand, I planned my dinner. Natually, I started with thick cut lamb chops from Sexton Ranches; I've never had better lamb than that raised "natually" right here in Baker County! 1. Marinate chops with a bit of XV olive oil, cracked pepper and a bit of good dijon mustard for 15-20 minutes. 2. Pre-heat a deep saute' pan;' add butter, shallots and garlic. Cook over medium heat until softened and slightly transparent. Add sweet potatoes, and stir to coat with butter mixture (add a splash of olive oil if needed). Cover and let cook 5 minutes. 3. Add white wine and toss mixture a couple of times. Raise heat slightly, cover again and cook for 3 minutes. 4. Push sweet potatoes to the sides of pan, place lamb chops in center of pan, pour marinade over chops and let cook until seared (2-4 minutes). Turn chops and cook until finished - 140 degree internal temp. Serve with green beans and plum chutney. BELLA has several delicious wines from K Vintners including a delicious Cabernet blend called House Wine, K Syrah 'Lucky #7' , The Creator, The Boy and the K Syrah 'Milbrandt'. BELLA is open 7 days a week from 7 am 'til 7 pm (thanks to Guido!) and we are always happy to help you find the perfect wine for whatever the occasion. Stop in, give us a ring at 541.523.7490 or contact us at www.BellaBakerCity.com anytime! What a wonderful story you have shared with us all! I just love it that you've kept me on your mailing list. There is no other place like yours in the world, and I miss you and BELLA so much! Plan on me calling you about the wine club. You are the best! Nice to get your blog (John Paul and I were discussing it over lunch last week). How are things going? I hope the La Villa did well for you; it certainly exceeded my sales expectations. What a gem!